From the moment North and South Korean athletes marched together into the stadium, Feb. 9, a spirit of unity and peace has dominated the Pyeong Chang Winter Olympics. These games could not have been held in a place of greater world tension, a Korean peninsula menaced by storm clouds of thermonuclear war. This reporter witnessed that tension first hand in 1983; I was one of several hundred delegates to the International Organization of Journalists conference in Pyongyang, Democratic People’s Republic of Korea (DPRK). Our hosts took us down to Panmunjom and a little further south to the armistice line. I saw a U.S. Marine in full dress uniform standing at parade rest in a room that had the 38th Parallel running down the middle. Through the glass partition I reminded the Marine that the Armistice ending combat was signed in 1953. Thirty years of occupying Korea is long enough, I said. It is time to sign a peace agreement and bring all U.S. troops home. That was 35 years ago and the U.S. troops are still there and under Donald Trump it could become the flash point that incinerates the Asia zone in a nuclear exchange. The Republic of Korea and the DPRK are technically still in a state of war. Korea remains divided, a Cold War tragedy that has torn families apart, never to see each other again. 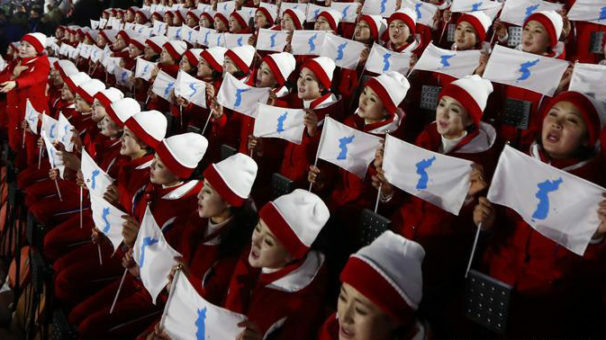 But floating above the unified Korean team at these winter games was a banner with a silhouette of Korea no longer undivided, the deepest longing of the Korean people both north and south. 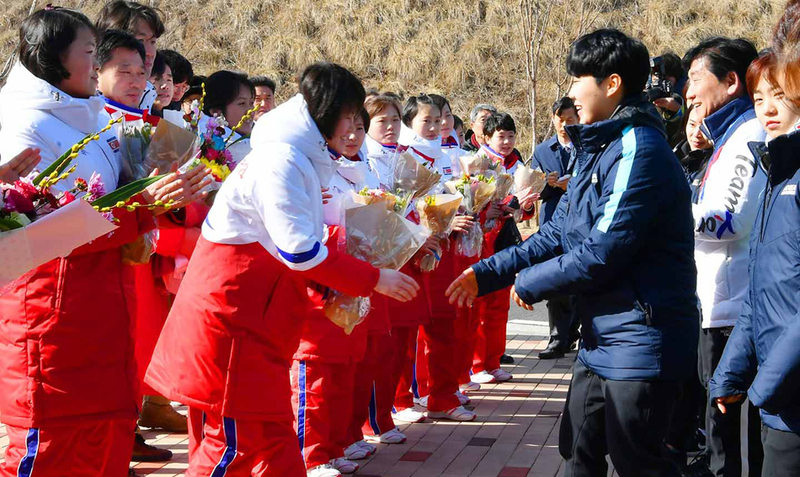 Two young women, Park Jong-an from South Korea and Chung Su Hyon from North Korea – both members of the unified Korean women’s hockey team – jointly carried the torch that lit the flame for these games. Watching the opening ceremonies from a VIP box was Kim Yo Jong, sister of North Korean leader Kim Jong Un. She shook hands with South Korean President, Moon Jae-in and invited him to visit DPRK’s capital, Pyongyang. A grim-faced Vice President Mike Pence watched from the sidelines. In his first State of the Union, Trump denounced Kim Jong Un as “depraved.” On arriving in Seoul, Pence vowed to clamp the “toughest and most aggressive” sanctions ever on North Korea. Adam Rippon, a champion figure skater, the first openly gay man on a U.S. winter Olympic team, soared on the ice, helping the U.S. figure skating team win a bronze medal. Moments after he skated, his team mate, Mirai Nagasu, a Japanese American from Arcadia, California, did a triple axel, the first American woman to perform this difficult spinning leap. Rippon and the rest of the American skating team were cheering from the sidelines. When Naguso stepped from the ice, Rippon threw his arms around her in a fond embrace. NBC news reporter, Mike Tirico, interviewed Rippon about his own performance and his teammates’ prowess. 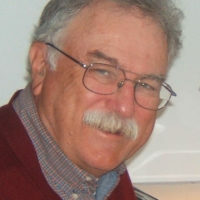 Rippon spoke of growing up poor, one of six children in his family in Scranton, Pennsylvania. 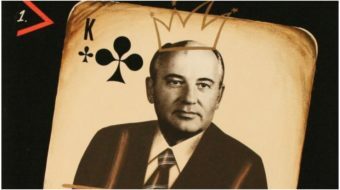 In his teenage years, he lived in a basement apartment, so strapped for money he could not buy groceries. And a few years later he is at the Olympic Winter Games. Tirico asked Rippon about his sharp criticism of Vice President Pence for his gay-bashing politics. One of the values his mother taught him, Rippon replied, is always to stand up and fight for your principles. He would not back down from his vow not to meet with Pence or to renounce his criticism of Pence for his gay bashing. Pence sent out a series of tweets claiming that he wishes the entire American team the best, including Rippon, and hoping for a U.S. victory in every event. Yet even this missed the spirit of these games. Victory is secondary to joining with competitors from the nations of the world, groaning when they stumble and fall, cheering when they stand up and try again. That generous sprit shined when Canadian figure skater, Patrick Chan, was on the ice. Chan fell twice as he attempted especially difficult axels. Yet he regained his feet and continued to skate. The Canadian team won the Gold Medal. A fall on the ice is forgiven. What is unforgiveable is to give up. 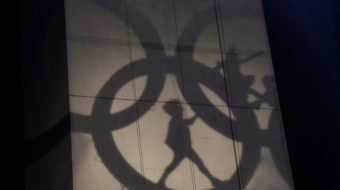 The politics of hatred and division, of winner take all, were not welcome at these Olympics. The athletes seemed to be telling the world to embrace their way of seeing the world—of give and take, win and lose. Let South Korean President, Moon, accept that invitation and travel to Pyongyang! 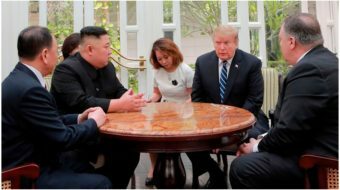 Mothball DPRK plans for nuclear missiles….and cancel Trump’s drive for new, more dangerous nuclear weapons. That will mean a Gold Medal victory for all of humanity. Should U.S. Olympic athletes unionize?